Live Creating Yourself. : Ladyplace: To Paint Black or Not? Help me decide! Ladyplace: To Paint Black or Not? Help me decide! My beauuuutiful and very WHITE Society Social bar cart arrived–yes, I went with white. Creature of habit to play it safe–and now I realize it just doesn't work against the all white walls. It gets lost. This whole wall in general is just... meh. So I'm thinking of painting the wall black. Again, creature of habit (office in first apartment, bedroom in second apartment). I posted on Instagram asking people what they thought and a lot suggested a deep navy, (Benjamin Moore's Hale Navy in particular, which is awesome) but I am just not sure how that would work since the rest of the room is neutral greys, blacks, beiges, and whites. Thoughts? Others are suggesting deep charcoal. Or... what about bright pink?! Inspired by this and this. And for the record, 9 times out of 10 I kind of hate accent walls. But because this apartment is so small, it's more its own section of the room - the bar/library, if you will. It would hardly even be photographed with the "office" or the "living room" parts, both of which kind of have their own looks going on. I think charcoal/gray would work well with the rest of your design and still help the bar cart "pop". I also think the arch would make the dark color even more striking! what about a gold, spray painting it in a metallic bronze. I could be crazy, but what about a thick dark charcoal (or black) stripe, floor to ceiling, just behind the bar cart? Wondering if painting the whole wall might be overwhelming?? My wild two cents =) xo! I like the idea of a dark charcoal gray as well. What about doing a dark accent wall (I'm on board with charcoal or navy :) behind the bar cart then painting just the arched doorway hot pink for a pop of fun color? Or you could do the bottom half of the wall in a dark color and the top half in a lighter color? add a little trim in white between the two? I'm not a fan of feature walls either, but I agree with you that it will work well here. Navy is not my choice for the reasons you stated, but black (my 1st choice) or charcoal would look really great. As to being a creature of habit: why mess with success? You did a great job on the other rooms you listed, it's going to look great here. Congrats on your new place! Ohhhh I LOVE the idea of painting the under archway a hot pink and then the rest of the wall a deep navy or charcoal. Black looks great but since you won't be here forever, maybe it's a good opportunity to try something new?? Who knows! You might like it even better. I love a black wall! Would look awesome!! i vote black!! as much as i love navy, it's not right for the space. i can't wait to see it! 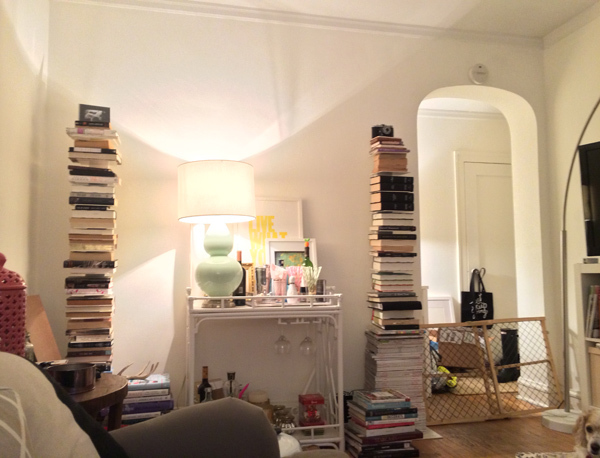 ps i have been hunting for bookshelves like yours and can't find them anywhere. i want some! I vote on dark charcoal because it's different than the black you've done but still similar...plus it will match well with everything you have already. Second choice is black...you can view it as your "signature" in every house. I say no on the navy. I love the idea of a deep navy! You need something dark for some contrast! You call this your lady place....go with the pop of bright pink! When else will you have the opportunity for a pink accent wall? It will look awesome with the white bar cart and gold and black accents of your bar accessories and the books. If you're going to go bold, why not add some pattern? Wallpaper! A huge floral like this: http://www.thibautdesign.com/collection/high_res.php?patternID=1380&productID=8509 or something like Alex did in her bathroom: http://akstudioblog.com/?s=powder. Not to add another choice into a mix, but ok yea, how about a deep forest green? I love the black idea and if you were to go navy i suggest Benjamin Moore Newburyport Blue. It's the bestest. I did Benjamin Moore French Beret in my living room and I love it - sort of a deep charcoal with a navy tint... Combines all of the above suggestions. http://www.benjaminmoore.com/en-us/paint-color/frenchberet (it has just a bit more navy tint in person, but still mainly charcoal). love the bar cart, but i think it would be crazy cool if you did long floating bookshelves along that entire wall and made it a true library nook. maybe bring back that cute armchair you had at your old place and set up a small bar area (just a tray and a few things)on one of the shelves. it will keep the floor open and allow you at add more seating. then you could use the bar cart in the dining room to store the rest of your goodies. i do think a pop of color under that arch would be pretty sweet too. I like the second pic of the bright pink. Pink would be nice, but what about the bottom part of the wall in bright pink and the top in an almost white gray.? Benjamin Moore has a really great color called baby seal black. its kinda black, kinda blue, almost a matte finish. i used it my kitchen. love love love it. check it out! i saw it on apartment therapy a bunch of times even in baby's rooms. Eeek, if it's a rental I would hesitate to paint it a dark color. Why not either returning the bar cart for a darker color or painting the bar cart itself? I think silver or gold would look awesome. If I were in your shoes, I would skip painting the wall entirely and paint the bar cart out in neon yellow. :) I'd also switch out/paint the frames on the bar cart to make them pop against the wall. I'd also hang something else, either some more art, faux taxidermy, clock, etc. over the bar cart. I think charcoal would be perfect in this space! I've really enjoyed seeing your lady place come together. I vote pink! I agree with Christina, this is the lady place...she deserves a pink wall!! Are you still painting the entryway black/white stripes? If so, I think you should do the same shade of black as the black of the stripes! It would help tie it all together. Good luck! I think black may make it feel too small-but you could do a great charcoal or gray, or go with something warmer toned to make the cart stand out, like a peach-y beige! I can't remember if you still have pink throws on your couch still or not, but even if you don't, I most definitely, hands down, vote for some shade of navy or indigo! Then again, I'm slightly biased as I can't get enough of the colour right now and am using it a lot! ha! But I do love the way that navy or similar shades look with grey, I it will look fabulous! Your pink straws will go so well with blue! Hale Navy, for sure! I painted my powder room Hale Navy and loved it so much, I decided to paint my entire basement the same! In the night time it is so dark it looks black, then with lots of light is a beautiful blue. Plus, I always suggest mixing the neutrals - grey and black will work great! nice for posting this article much information and interesting for all people regards.. I agree with you, I am not a fan of accent walls - in general. Folks may have said this already in the comments, but don't do high-gloss unless your walls are in impeccable shape. Glossy paint on wavy walls is a nightmare - it shows every flaw. Since you just did the kitchen black, I wouldn't necessarily branch out to navy for this wall. Even though I love navy and black together, I don't think that is going to come off right - unless you go whole hog and start bringing in textiles that tie the two colors together. Pink would be wildly fun. Black is a fine idea. But what about exchanging the cart for a wildly yummy color, or go with basic black for longevity?